Wow. I’m shocked by the passing this morning of Leonard Nimoy. I’d gone years without watching any Star Trek: The Original Series, or any of the movies featuring the original cast, before I decided recently to do a series of Video Fridays posts on a late night lineup of TV reruns that I was fond of in my youth, a lineup that included Star Trek, and I published my post on Star Trek just two weeks ago. In preparation for writing that post, I watched many episodes of the TV show, reconnecting with what I loved so much about it. And then, this past week, I was home sick in bed for two days and binged on more Star Trek, including the movies. 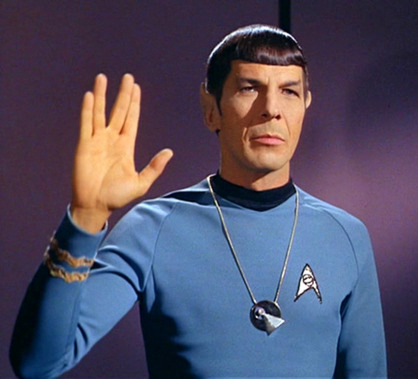 That Leonard Nimoy should die today, frankly, creeps me out as much it saddens me. I think it must be nearly impossible to grow up Jewish in the late 1960s, 70s, 80s, etc., and NOT know, with enormous pride, that the two main characters in Star Trek, Captain James T. Kirk (William Shatner) and Mr. Spock (Nimoy), were played by Jewish actors. Years later I learned that the Vulcan salute (seen in the photo above), was derived by Leonard Nimoy from a blessing bestowed by Rabbis, where the hands form an approximation of the Hebrew letter shin, shorthand for the Hebrew word Shaddai, one of numerous Hebrew names for God. As an actor, I think the best compliment one could give would be that his portrayal of Mr. Spock was defining and masterful. While Gene Roddenberry may have dreamed up the character, Leonard Nimoy brought him to life and was always believable as that half-human-half-Vulcan caught between the competing aspects of his nature. While I was very impressed by Zachary Quinto‘s performances as Spock in the recent reboots, Quinto’s was an act of imitation and Nimoy’s an act of creation. I couldn’t pick just one video to accompany this obituary, and so I’ve included two. The first is perhaps the most moving scene from all of the TV episodes and movies, a scene that epitomizes Spock’s Vulcan logic, as well as his very human emotional bond to Captain Kirk. The second is a compilation of clips from the TV series that highlight Spock’s human-Vulcan conflict, often to comedic effect. Rest in peace, Leonard, and thanks so much for the many years of thought-provoking entertainment. ‹ PreviousThe Magnolia Are Coming! Next ›Help! I’ve Got G.A.S.! Thank you for a great tribute to a very good man. We’re all sighing heavily in this household too.